The apartment has been recently refurbished with all amenities and tastefully furnished with many antique pieces of furniture. The style is original Italian liberty. It's at the second floor, sunny and offers an extended view over a Canal on one side and a characteristic courtyard on the opposite side. It is comfortable for up to 4 people. It consists of: 1 living/dining room with a sofa bed, 1 large bedroom with a king size bed, 1 small bedroom with 1 single bed and an extra folded bed, modern kitchen/dining-room (fully equipped for gourmet cook with fridge, freezer, washing machine, kettle, coffee maker, two ovens and all utensils and many recipes), 1 luxury marble bathroom with shower enclosure, 2 balconies and a lanai with sun curtains and table for candle light supper. The location is in the 'Cannaregio' neighborhood, few steps from Jewish Ghetto, where there is never a dull moment, thanks to its market, craft workshop, rowing clubs, and Casino, while relaxation comes in the shady parks and laid-back cafés and bars that line the maze of back-street canals. You will be just a stone's throw away from tourist routes, shops, restaurants, 2 minutes walk to the 'vaporetto' (boat bus) stop, 10 minutes from the Railway Station and 15 minutes from the Rialto bridge. Cannaregio is the epitome of real life in Venice (live there more than 60% of local citizen!). I'm an engineer with a passion for architecture and design. I work and live in Rome but my desire is to retire to Venice because my family is in Venice. In the meanwhile, I decided to share my apartment with my guests to share the mortgage and maintenance costs. 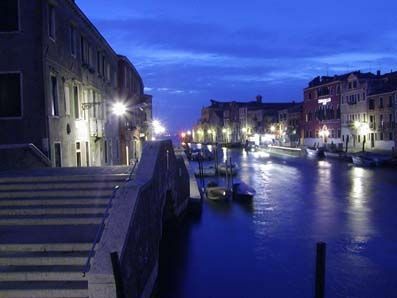 The location is very interesting to discover the secrets of Venice and to assist how local inhabitants live day by day. The apartment is sunny with 3 balconies, one has canal view. In the summer air conditioning is an important feature. Powerful and efficient system. There are two phans and two engines and both can work separately. Independent Heater to activate and set as desired. High quality of bed sheets, pillow cases, table cloth and towels are provided. The washing machine is in the unit and located in the kitchen. To dry cloths you can hang cloths outside the balcony as local inhabitants usually do. The living and sitting room is a dedicated room for listening to music, reading and watch television. It sits up to 6 people. New and efficient will serve up to 6 people dishes and pans. The kitchen is also a dining room with a table for up to 6 people. The dining area is in the kitchen. There is a big extensible table for up to 10 people. Table cloth, wine glasses, and tableware, crockery and cutlery are provided. Mainly guides and books about Venice and its arts. a selection of DVDs is offered to guetst for entertainement. 2 balconies overlooking a characteristic courtyard. Little terrace where you can have breakfast, candle light supper or simply relax drinking a glass of local good wine. We enjoyed our stay at Carmen's apartment. It was just a couple minutes from a vaporetto stop and easy walking to lots of interesting sights and shopping. The apartment was on a quiet canal, away from the tourists but just an easy stroll to all lots of hustle and bustle. I would highly recommend getting an extended vaporetto (water bus) pass if you'll be there several days which is very convenient and will save you lots of money. The apartment is a couple of flights up, but it's not a huge hike up. There are residents above and below and you can easily hear them walking around and talking. This noise did not extend late into the night though so it wasn't really a problem but ear plugs are always a good idea when traveling! There's a nice little balcony facing thr canal where I enjoyed morning coffee or evening wine. MUSEUMS, ART FGALLERY, MOMUMENTS AND TYPICAL ARCHITECTURE, ART BIENNALE, ETC. The security deposit will be kept by the owner and conidered as damage protection until the guests leave. Within one week upon final check the deposit will be refunded.